You can watch tutorials on how to set up your own business management system for the five key templates listed below by visiting the tutorials page for each main template. These are the templates that come pre-built with the tenxcel business toolkit but if you prefer to set up your own variations you can explore the tutorials and build your own system if you prefer. Every business should make an annual budget to use as a master document to guide business decision making. You can create your annual budget by using figures taken from your previous financial statements or from reports generated by your accounting system. If you have no figures to work with you can make some assumptions by gathering statistical data from the bureau of statistics or other business information sources. to see how to set up your own annual budget for your business there is a useful tutorial at the link below. Your annual budget is the master document but it is difficult to use it on its own to manage a small business. A Daily Operations System breaks down the annual budget into single days so you can easily identify daily cost of sales and daily cost of sales as a percentage. It also shows you a daily expense cost and an expense cost as a percentage of sales. 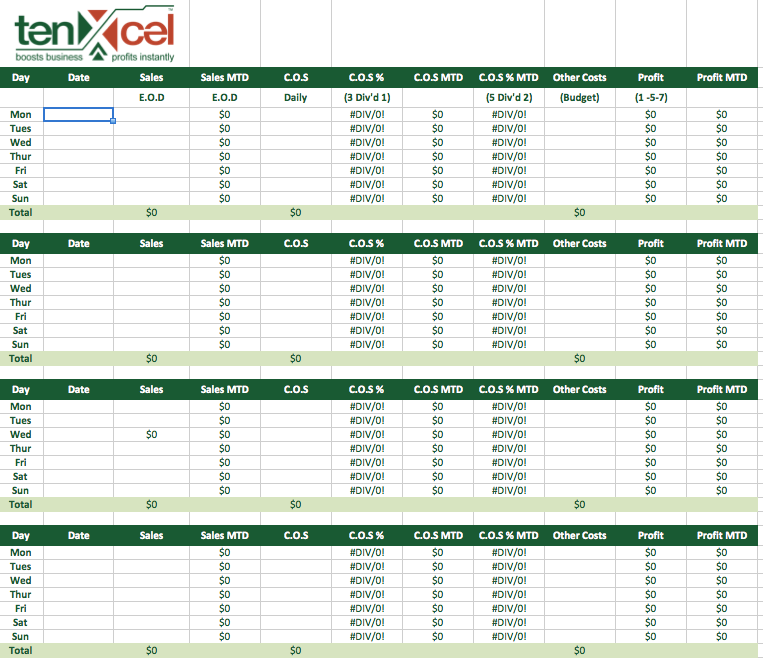 As the month progresses it shows the cumulative costs and individual daily profit along with a monthly profit figure. The daily operation system gives business owners a real time analysis tool to guide their decision making as the month is progressing. If you want to understand how to set up your own daily operation system please read the tutorial at the link below. An accurate cash flow forecast helps business owners predict their financial position at a future time. You can create a rolling cash flow forecast by taking past bank statements and expenses and projecting them into the future. You can also enter predicted daily sales and you get an accurate estimate of where your business will be at a future time. Every day you can reconcile the forecast against your actual bank balance and update your forecast. 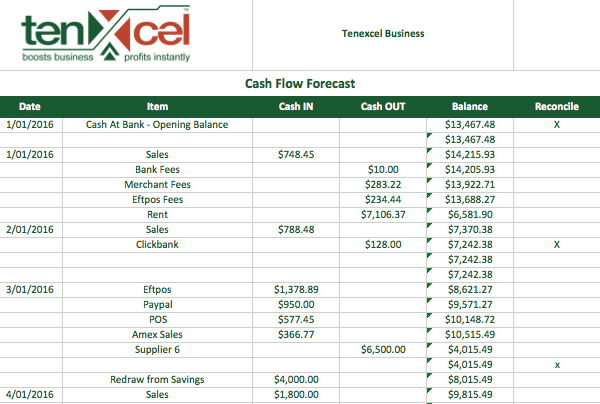 For full details of how to set up a cash flow forecast please read the tutorial at the link below. The next tool all small business owners should use is a basic purchasing budget. When you enter your invoices into an accounting system you see a total of expenditure with your suppliers. A simple purchasing budget works a little in reverse where you set a monthly amount you can spend with each supplier and as you receive a bill it is quickly entered into the budget and you immediately see how much you have left to spend in the month with each supplier. To set up your own simple purchasing budget please read the tutorial at the link below. Managing variable expenses or overheads is difficult. Overheads vary according to how much revenue the business is generating along with other external factors. Hot or cold weather for example can increase your electricity or energy consumption due to the need to heat or cool the workplace. Wages vary according to demand along with a whole host of other expenses. Setting up a variable costs management system will help you analyse your variable expenses against your sales allowing you to make changes that positively effect your business. For a tutorial on how to set up your own variables management system please visit the link below.